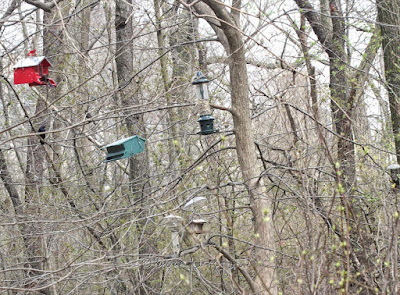 There is a portion of The Ramble in Central Park called The Bird Feeder Area and the name does not refer to people who feed birds, rather it refers to an area which has numerous bird feeders hanging from trees. 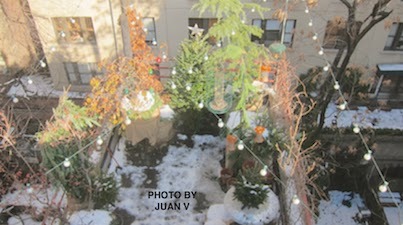 A partial view of it can be seen in the picture (which I took yesterday) atop entry. 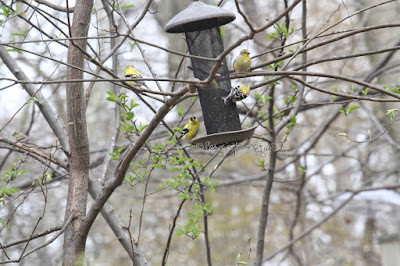 During the time I was there numerous American Goldfinches were congregating (and noshing from) a feeder which can be seen is at the extreme right of this photograph. 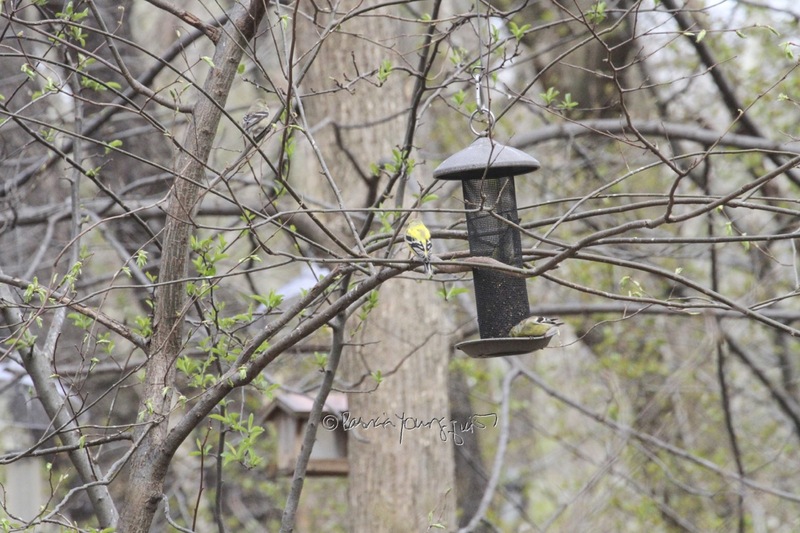 The following set of images feature both male and female varieties engaging in activities at or near to the aforementioned feeder. 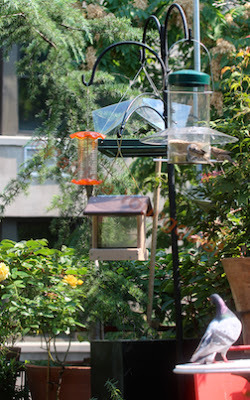 The type of feeder seen in the photos directly above is known as a Thistle Feeder, which is a type of feeder that I had in my garden a few years ago and described in prior posts here on Blogger; where the following pictures were included. 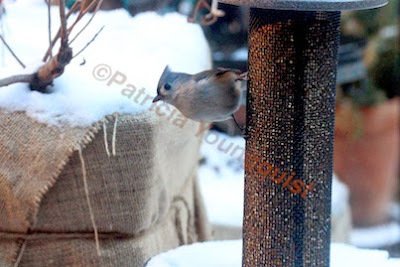 The set of pictures directly above, were taken during winter when (my rooftop garden had been been winterized) and a lone tufted titmouse stopped by for a snack. Unfortunately this type of feeder was very hard for me to open and also to shut in a secure manner and I gave it away. 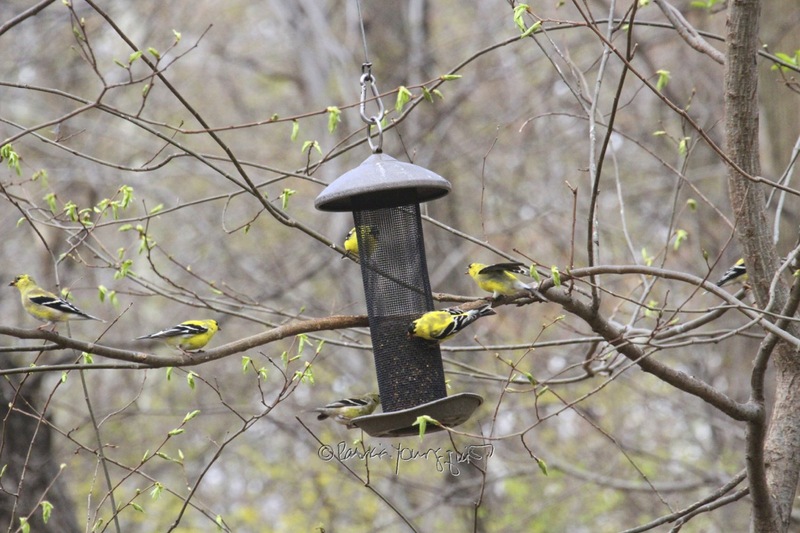 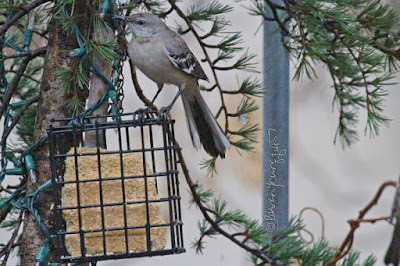 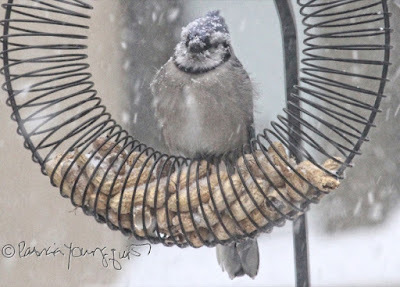 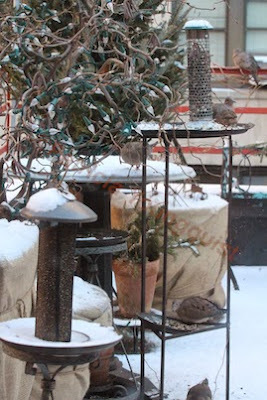 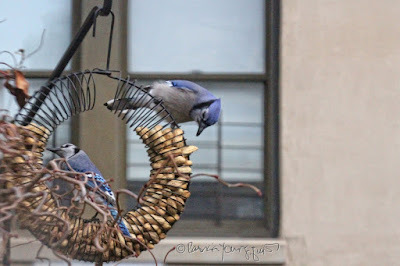 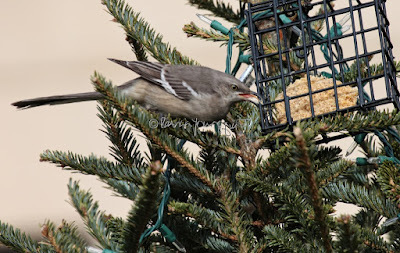 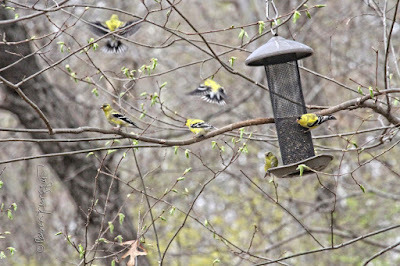 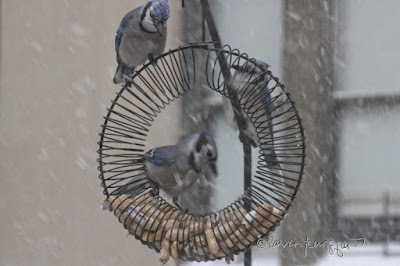 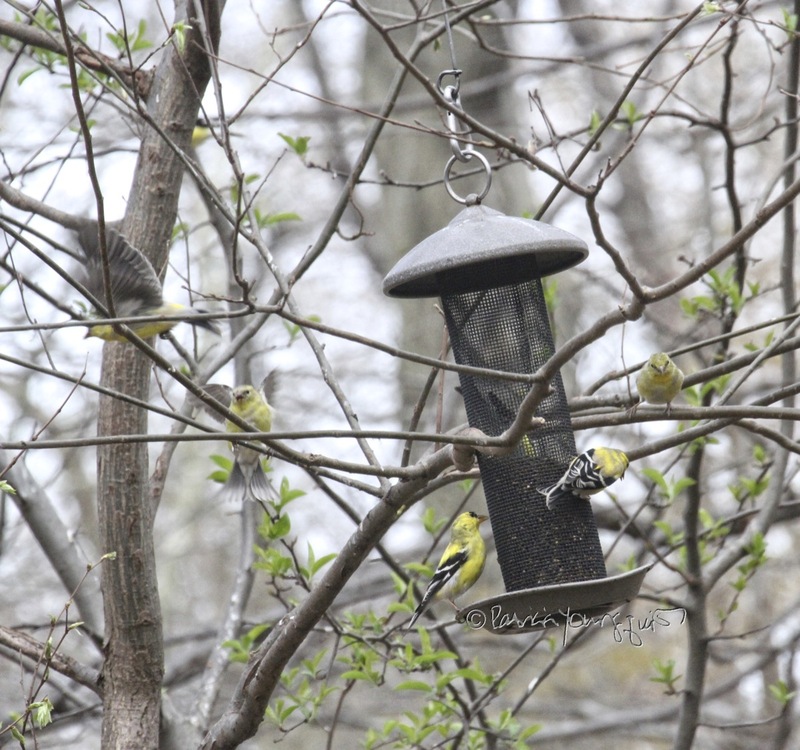 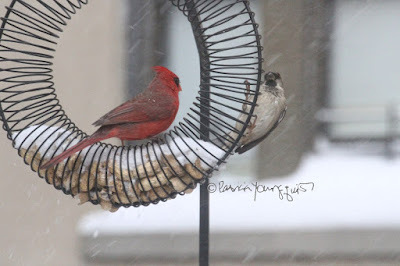 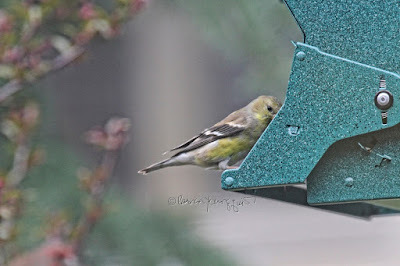 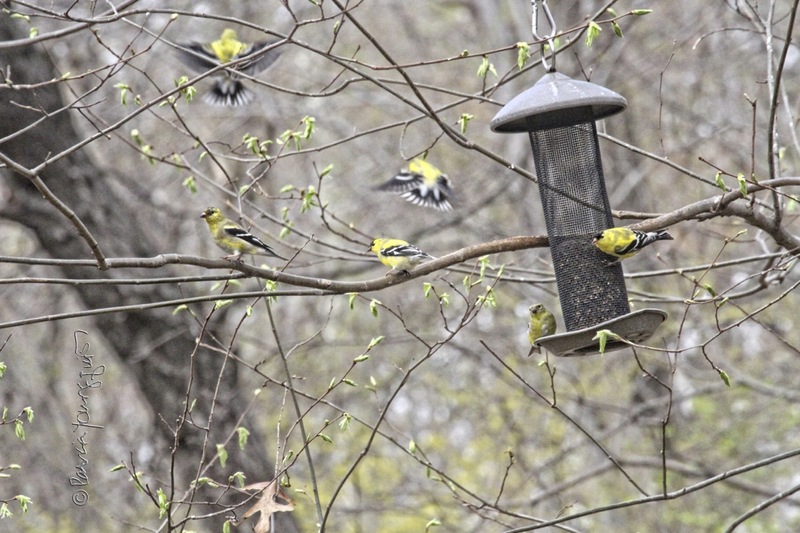 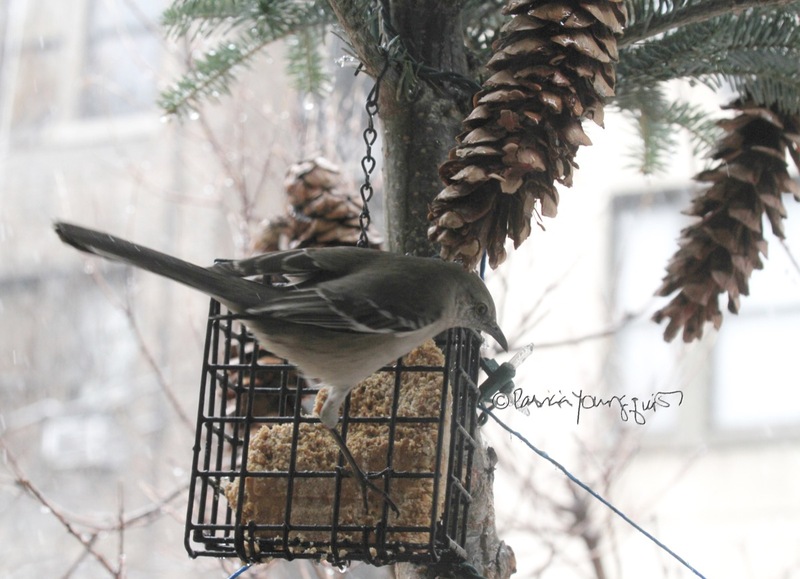 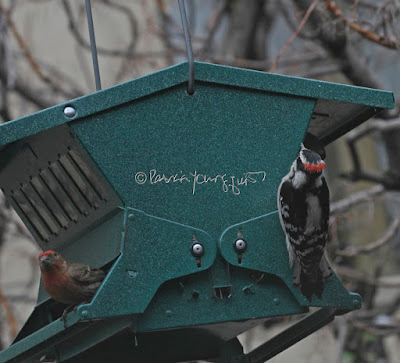 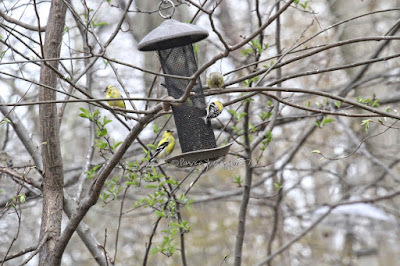 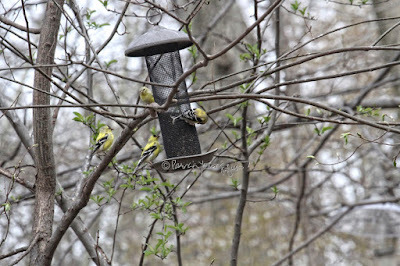 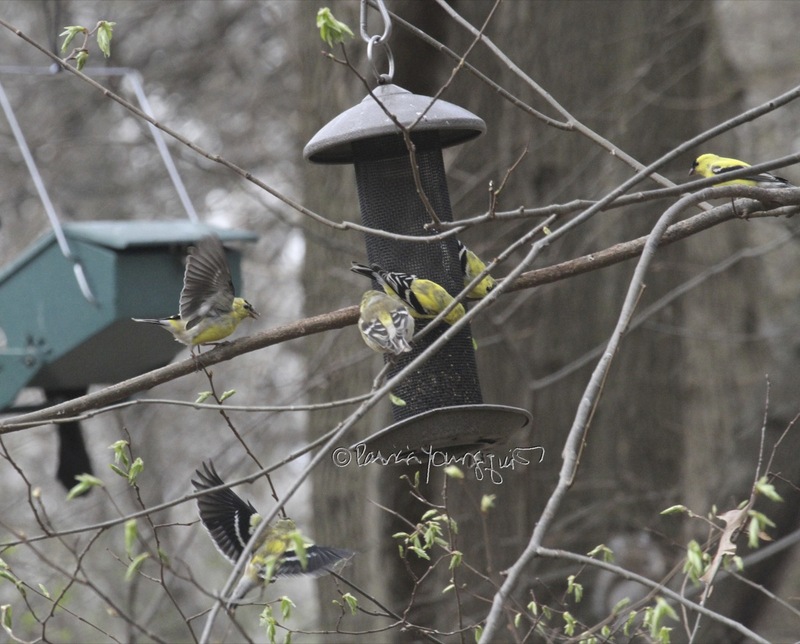 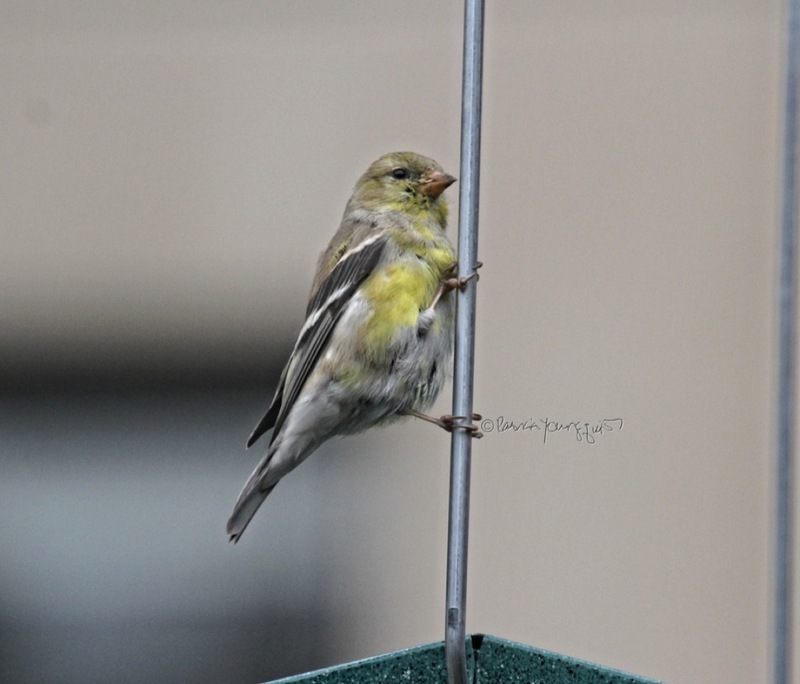 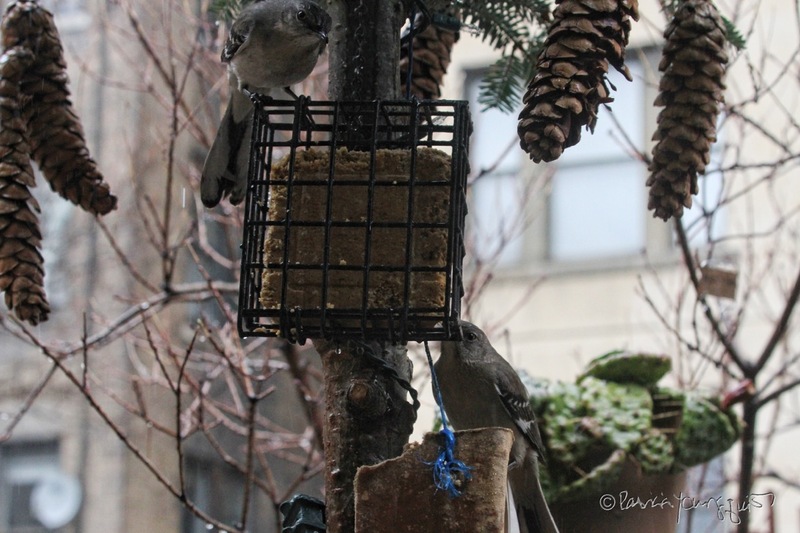 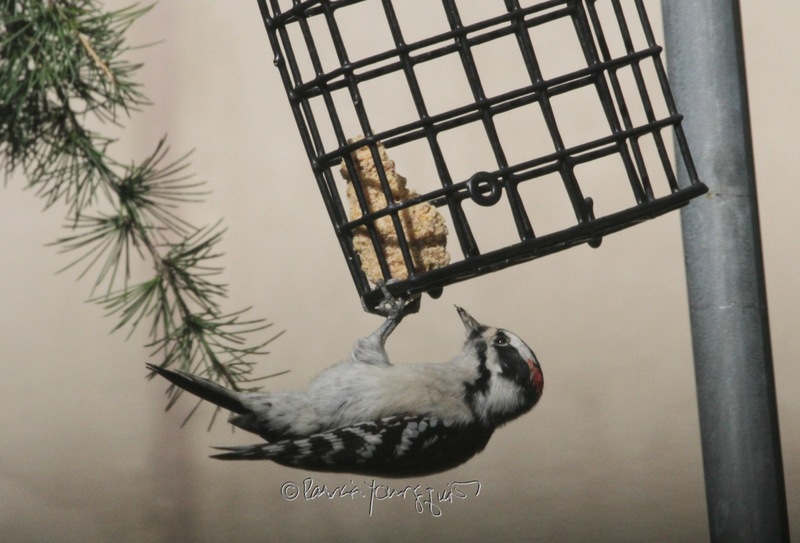 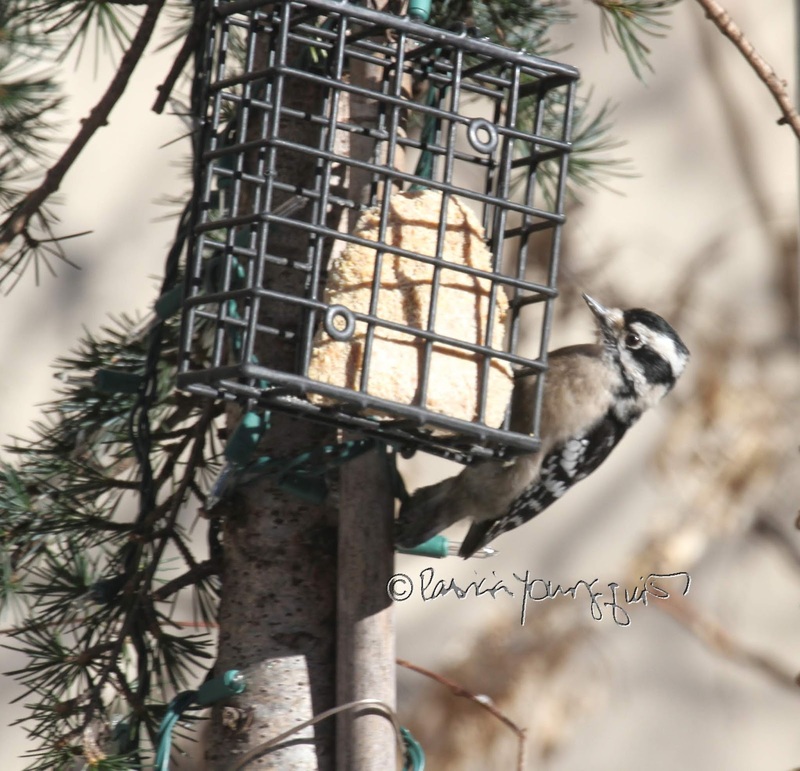 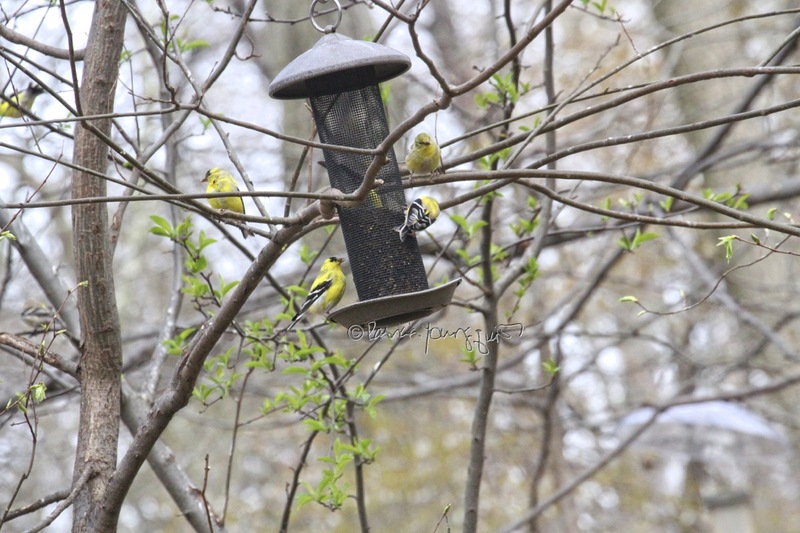 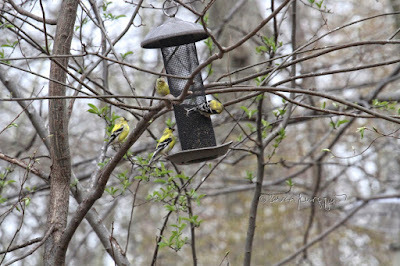 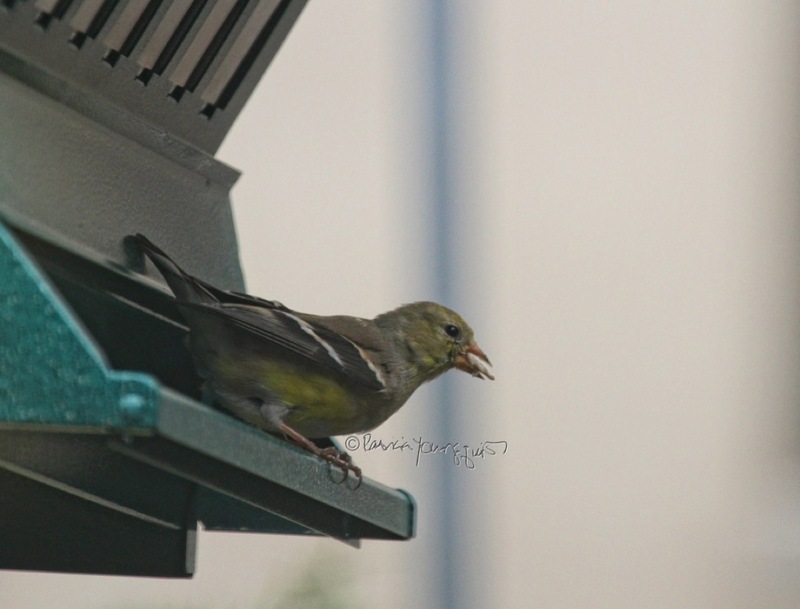 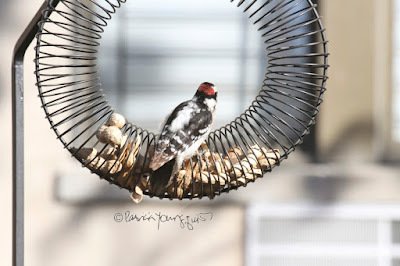 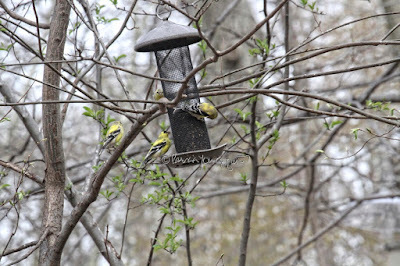 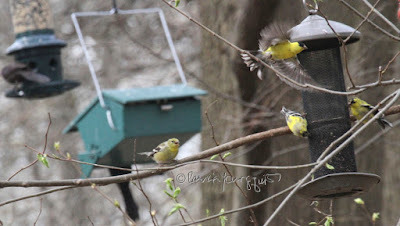 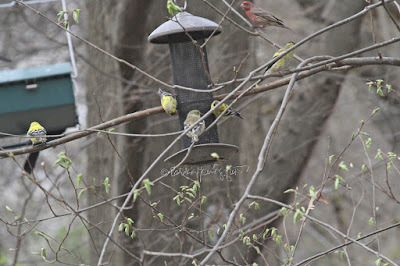 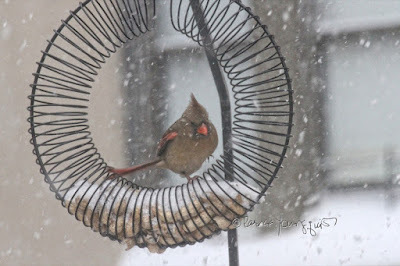 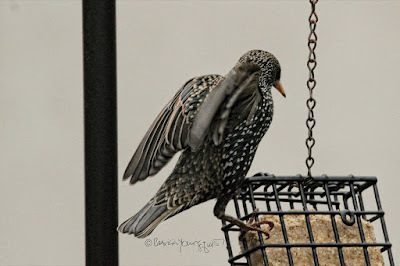 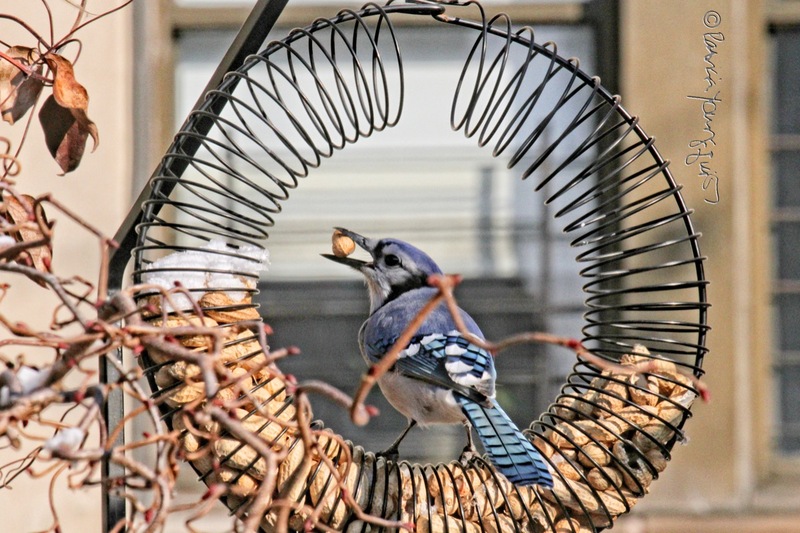 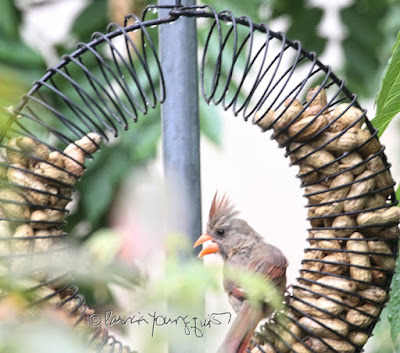 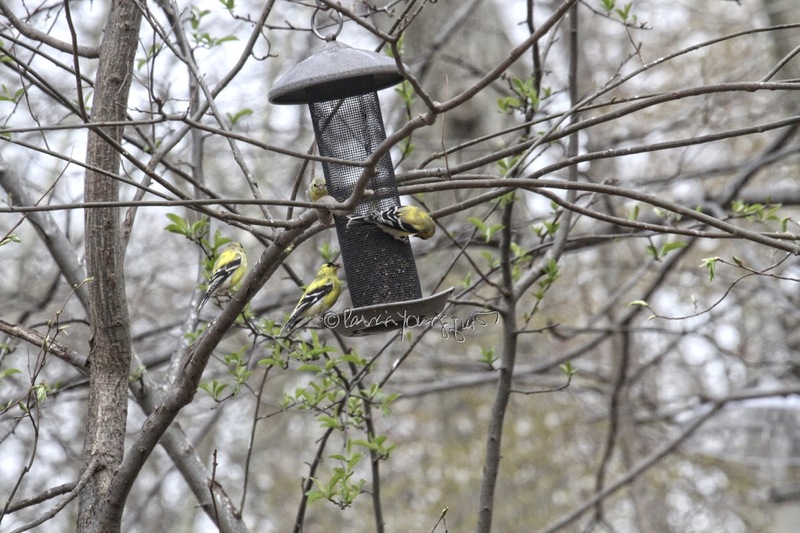 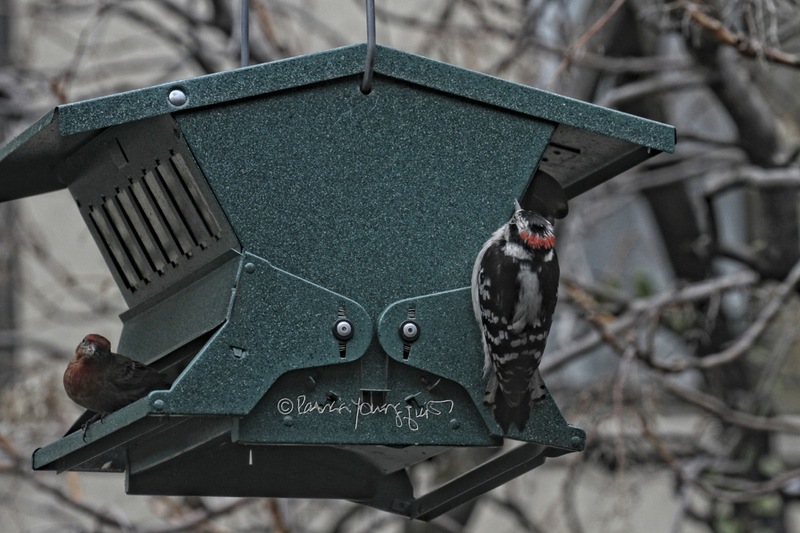 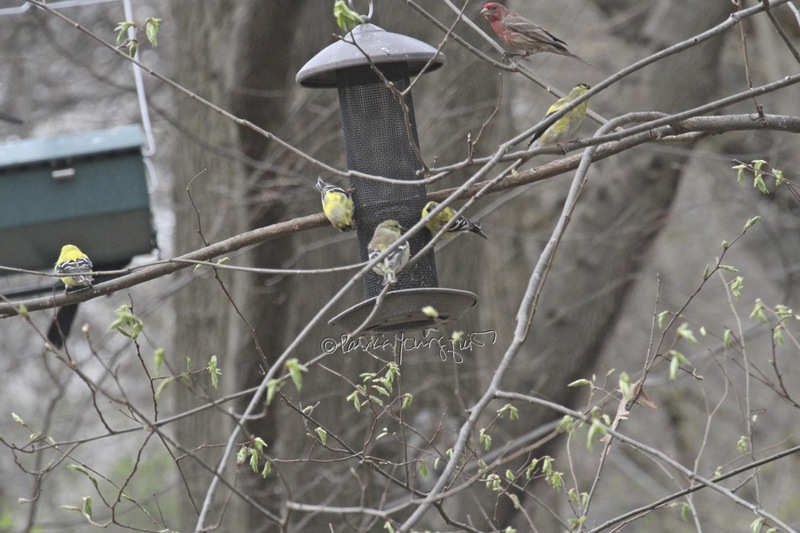 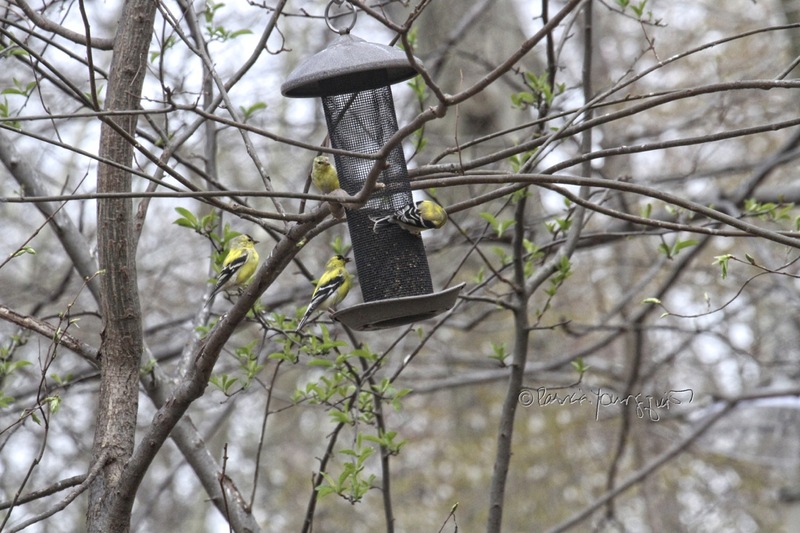 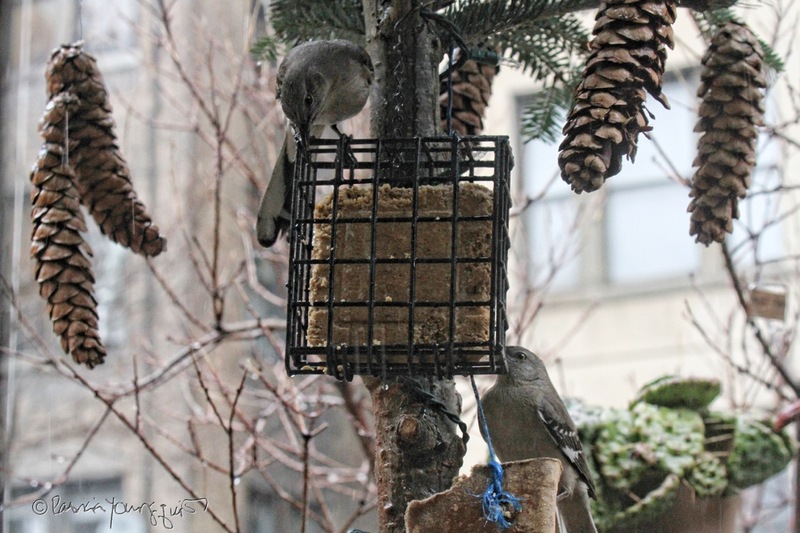 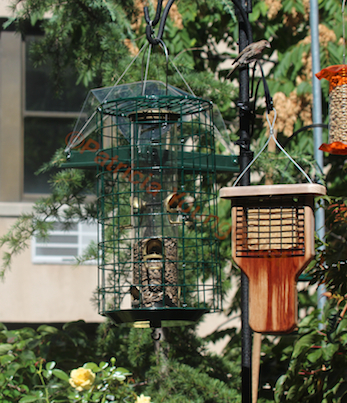 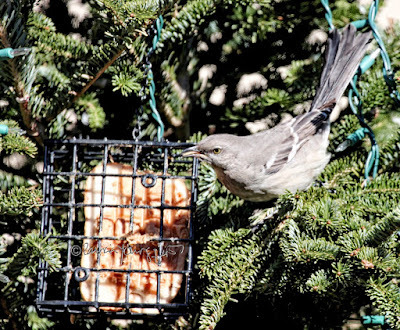 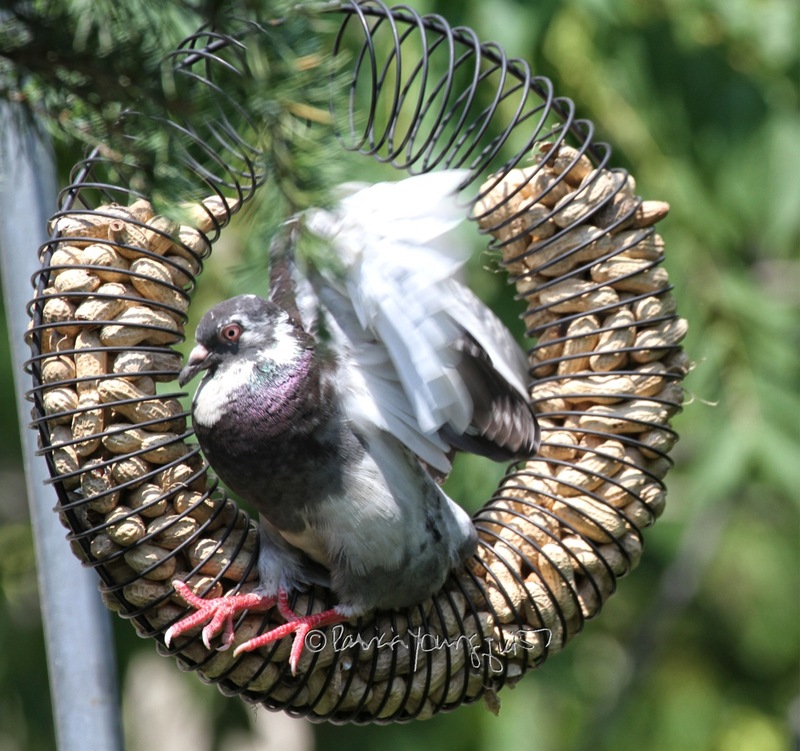 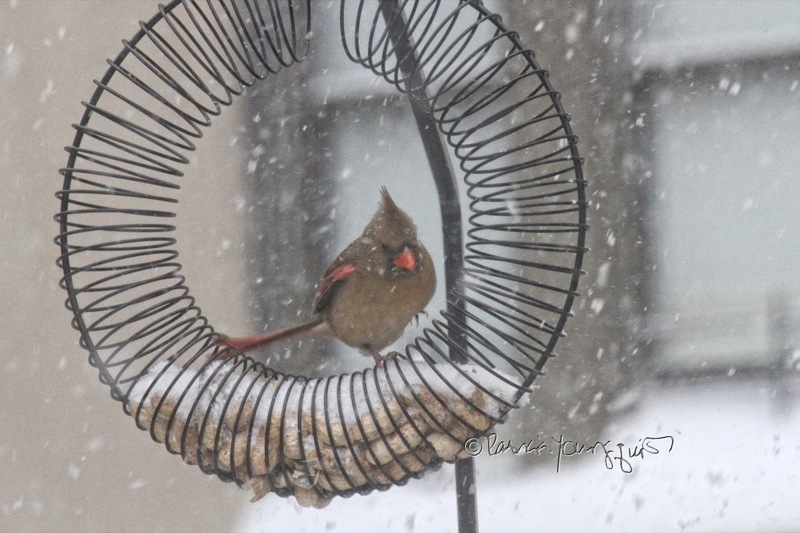 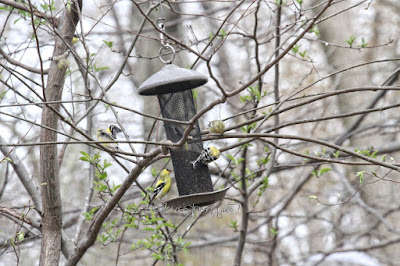 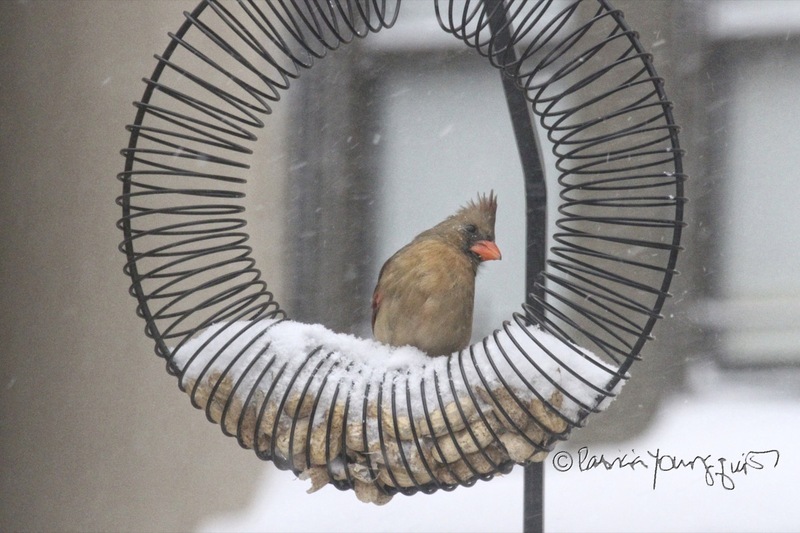 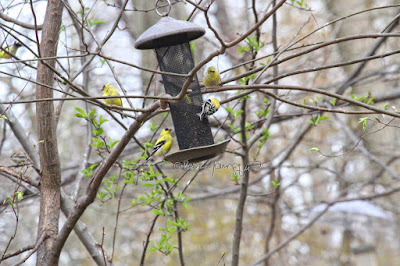 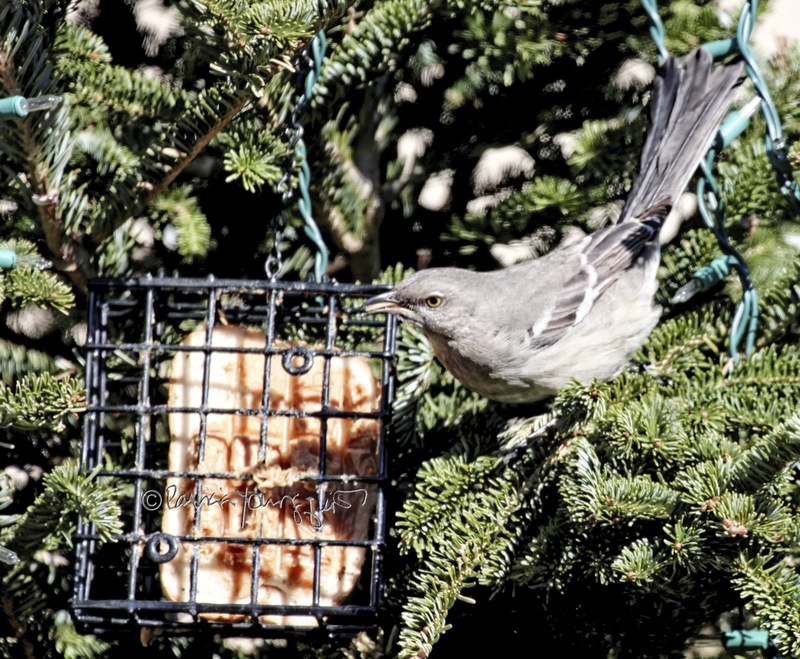 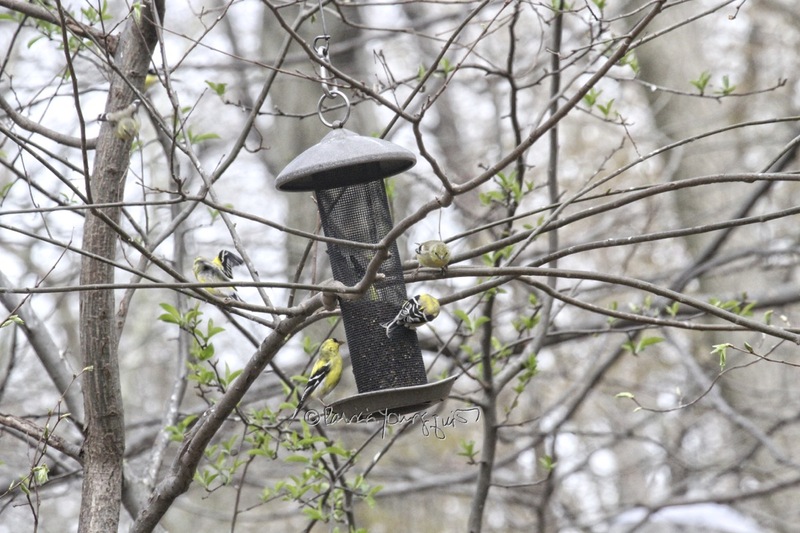 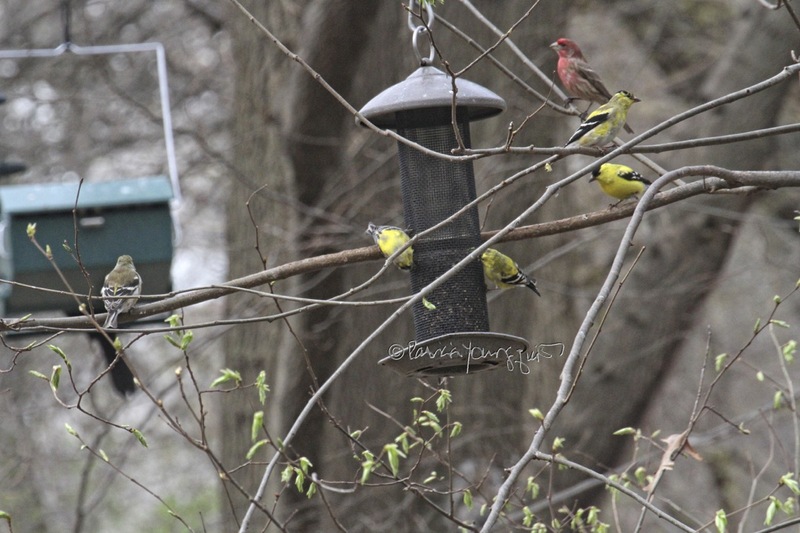 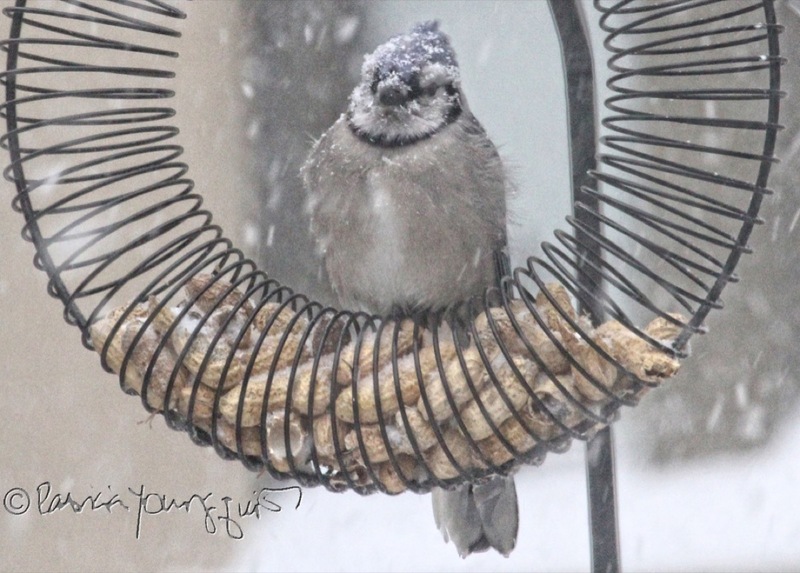 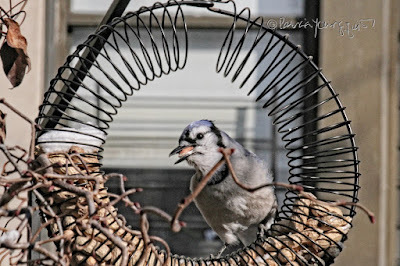 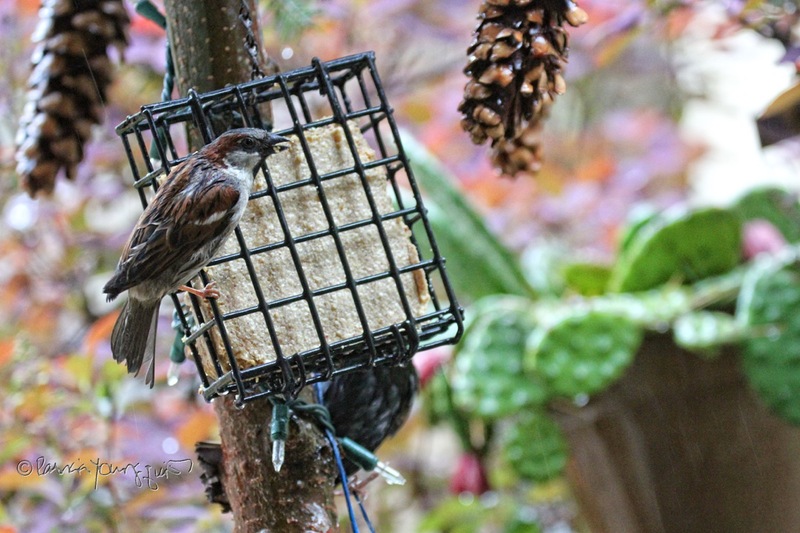 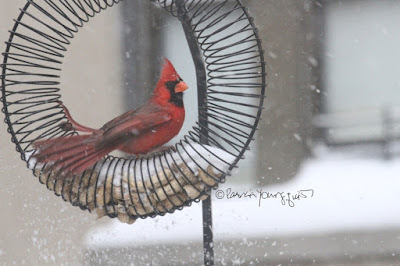 However, I did write about this feeder variety in an entry requested by hometalk (and I subsequently published a series on the subject of various bird feeders for that organization). 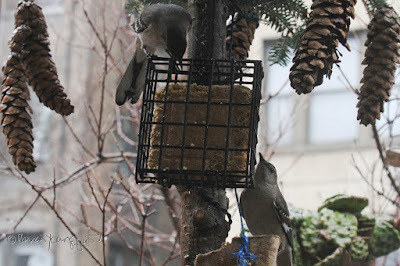 During that time I experimented with an array of feeders. 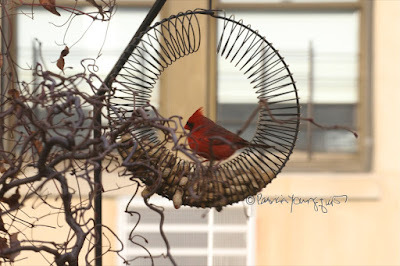 Partial views of my endeavors can be seen below. I ended up giving many of these feeders as well as the pole which supported to them to someone in exchange for him helping me with a task unrelated to birds or gardening. 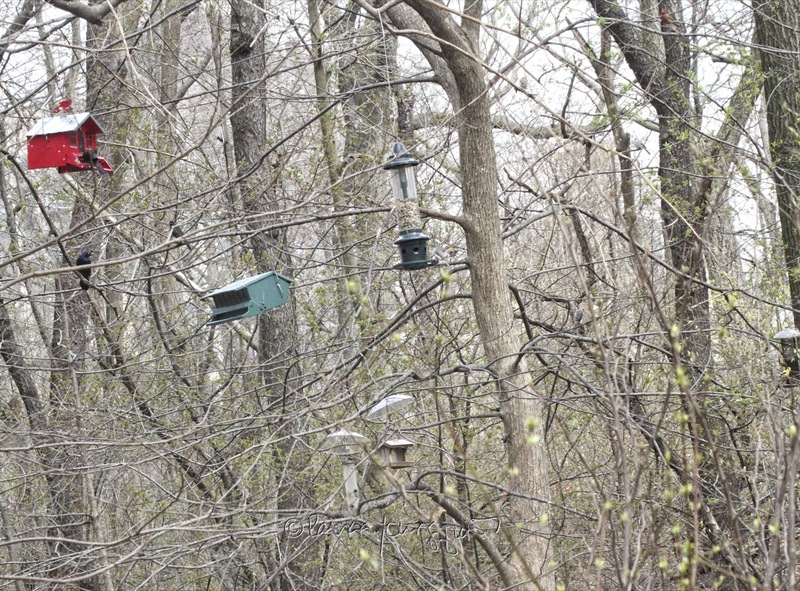 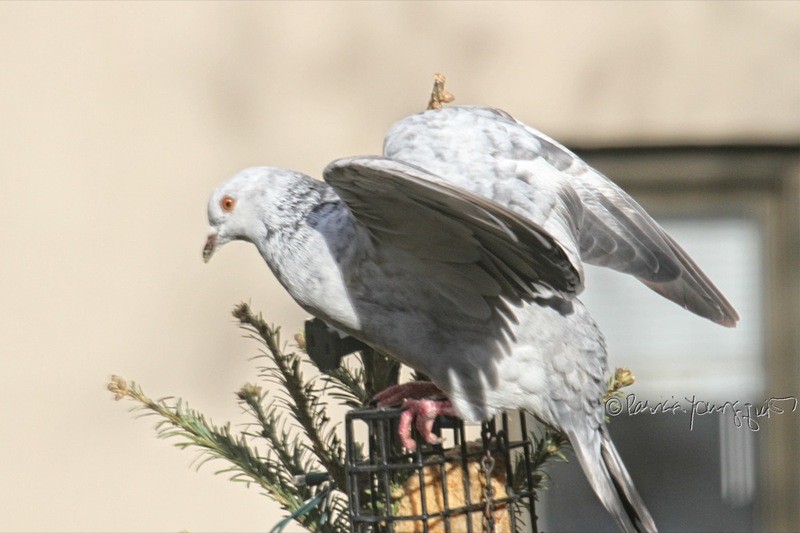 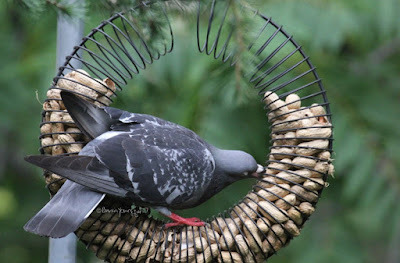 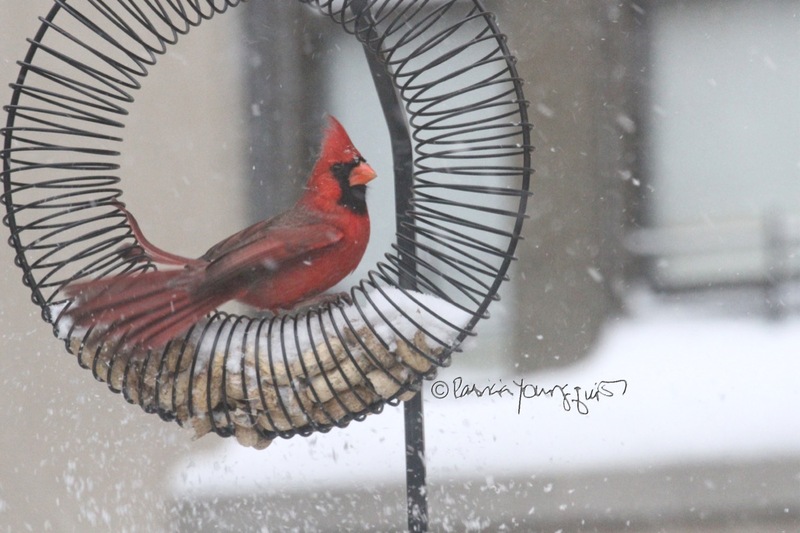 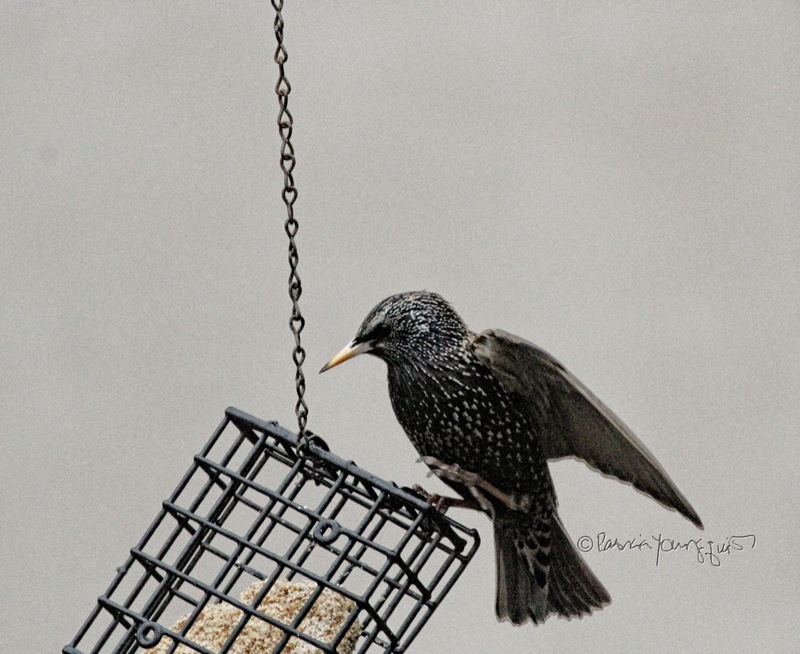 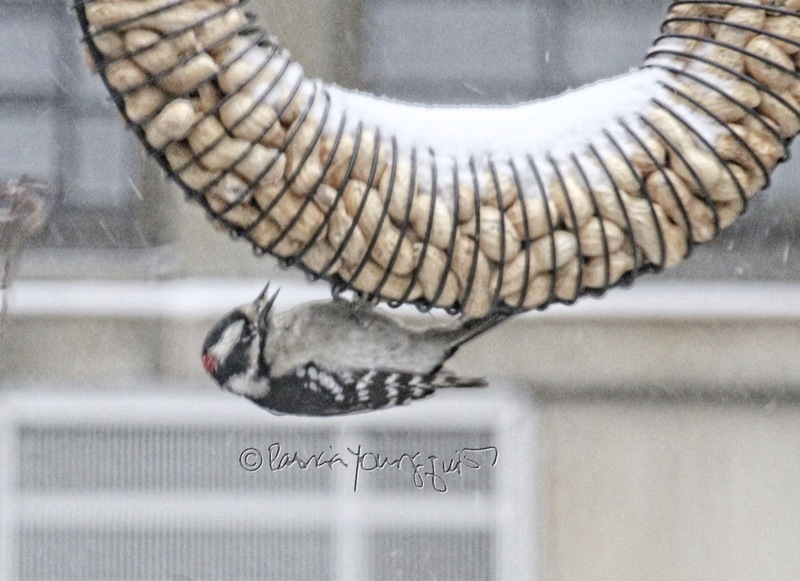 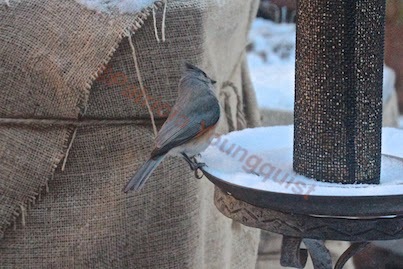 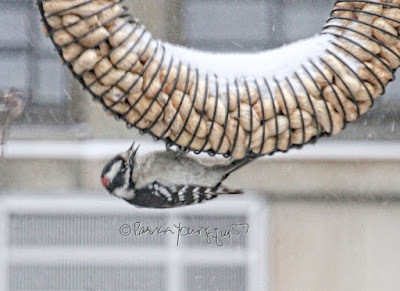 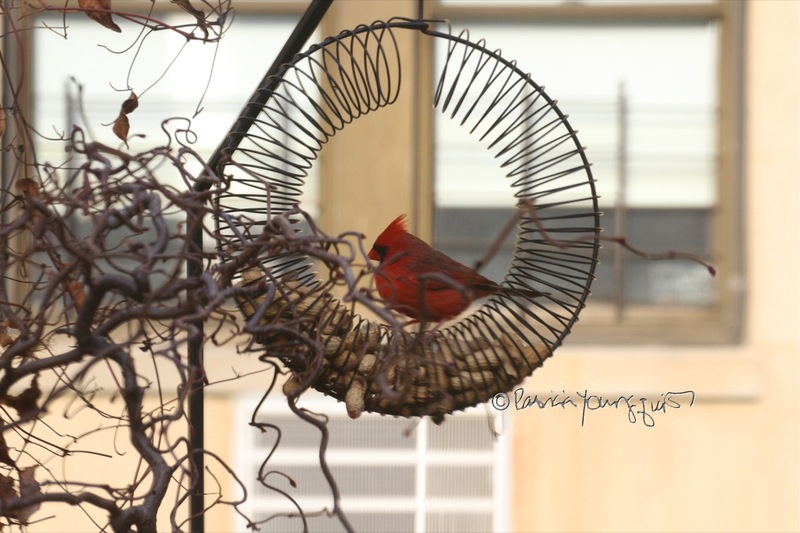 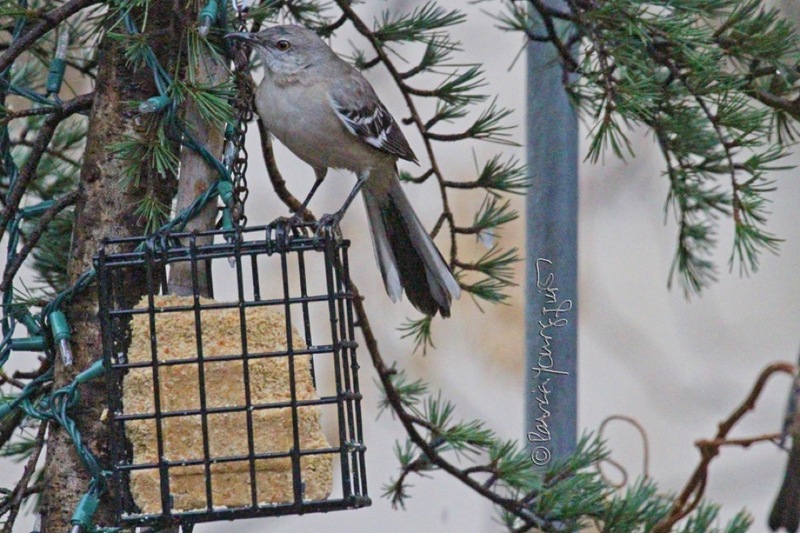 His parents had a home with a large yard which is a much better situation for having an array of feeders because birds can be more comfortable at a given feeder. 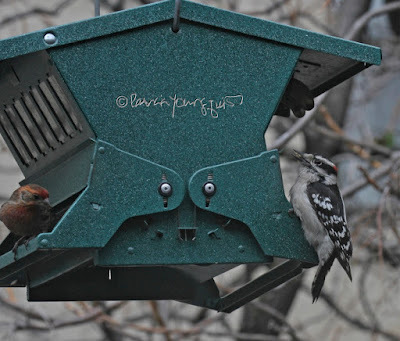 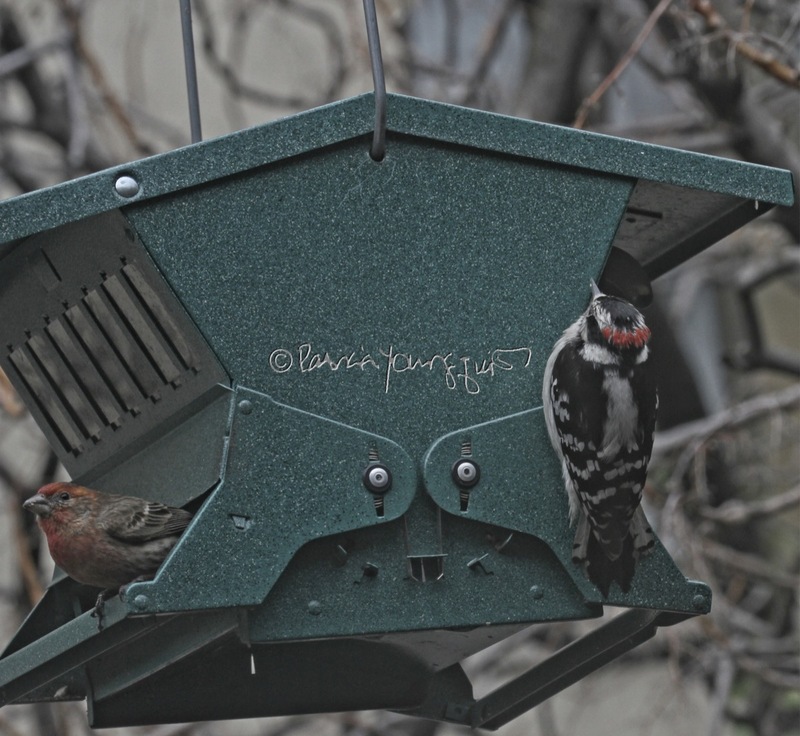 But, be that as it may, there was a time my garden looked something like the Bird Feeder Area in Central Park. 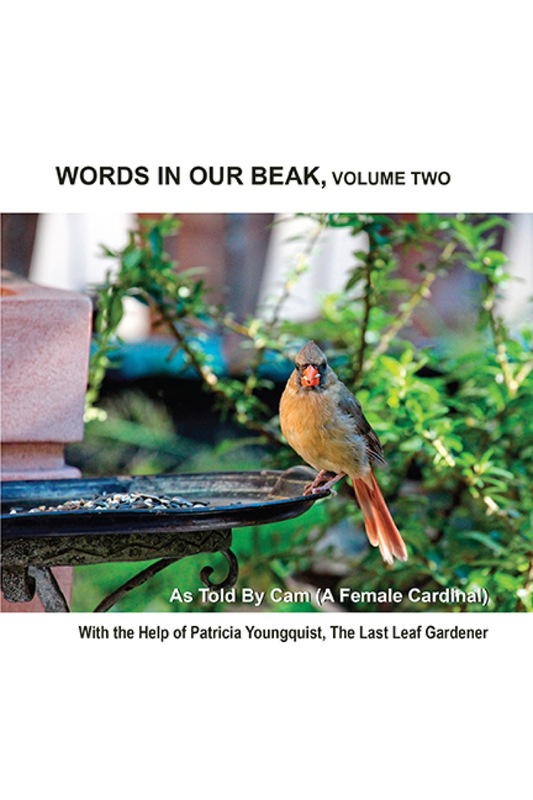 I have written about all of these feeder varieties for hometalk. ... and one I call I call The Monopoly House (because it reminds me the houses used in the Monopoly Board Game) seen below where American Goldfinches are either "hanging out" on the pole that supports it or noshing from the seeds that are "housed" there. 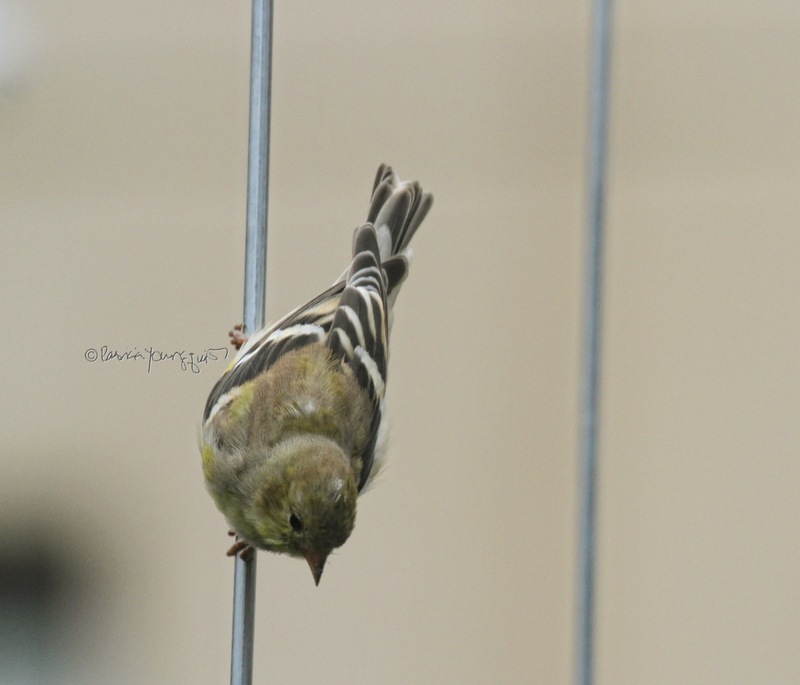 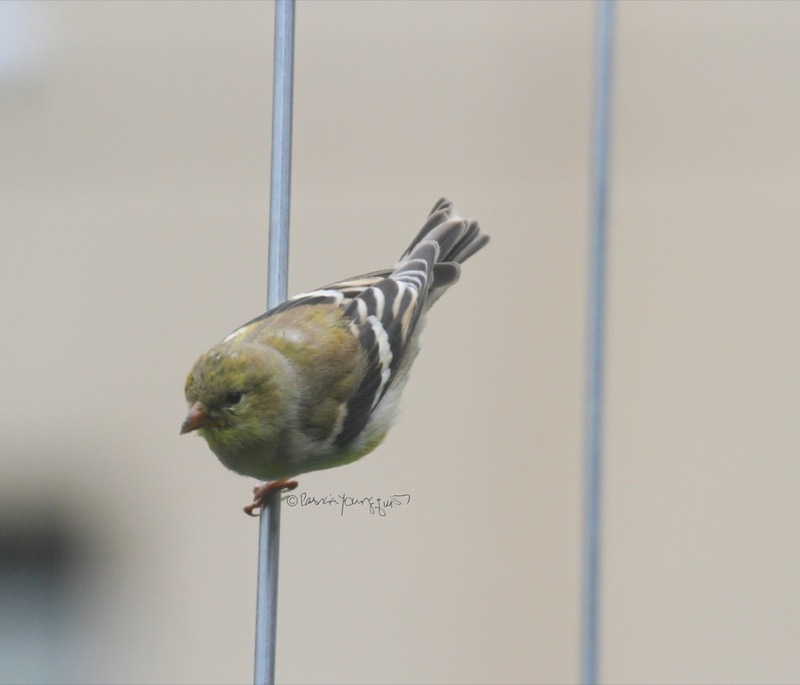 You may have have noticed in the first picture included in this blog post (atop the entry), The Bird Area in Central Park also has a "Monopoly House" but the American Goldfinches enjoying this location seem to prefer the Thistle Feeder; as evidenced below. 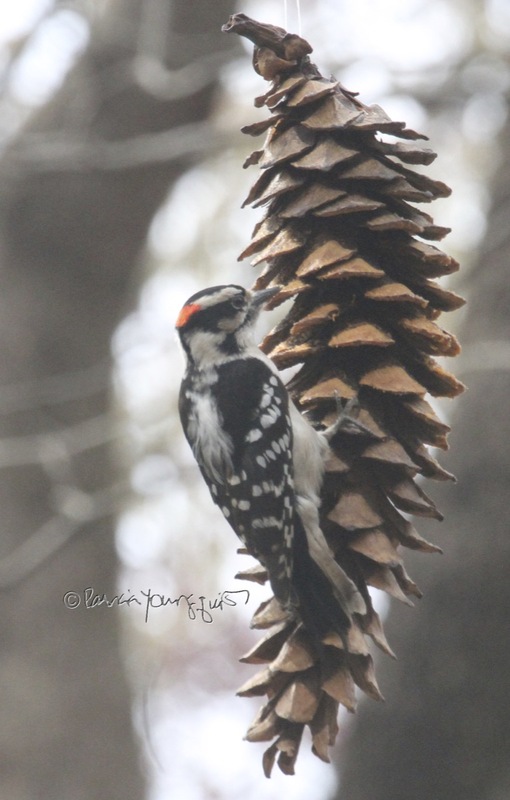 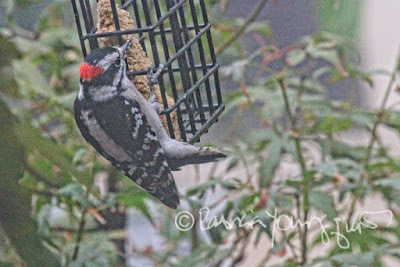 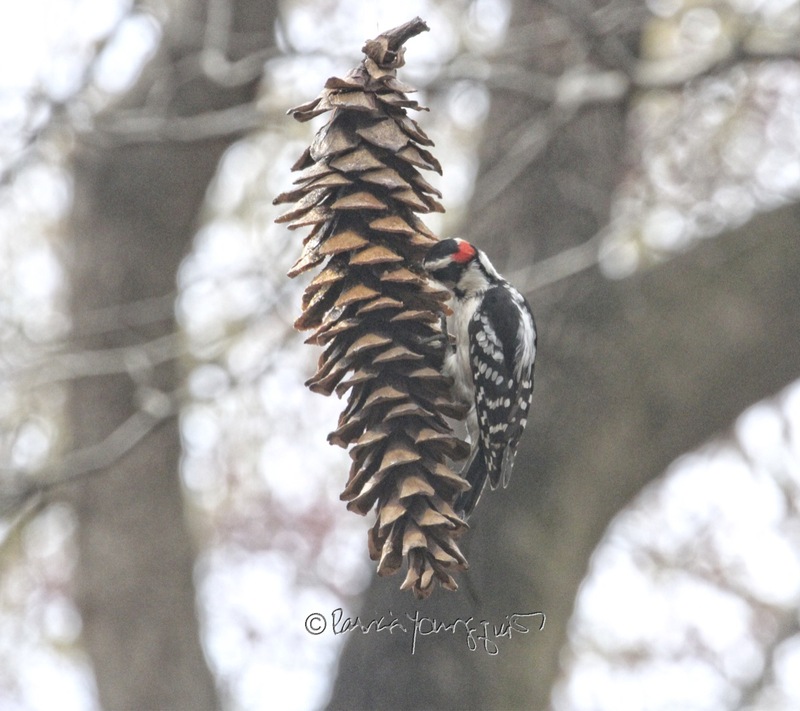 The volunteers who replenish the feeders in this area probably put some type of nourishment on pinecones (that are also hanging there) for a lone downy woodpecker was nibbling on something at the "cone feeder." 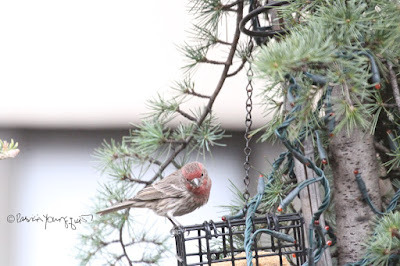 ... where a male house finch is also noshing from that feeder. 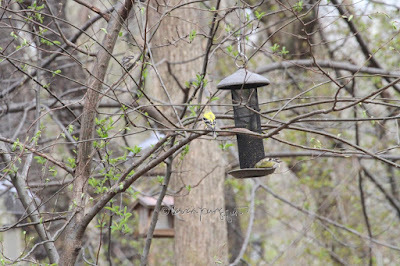 But I didn't see the American Goldfinches or the Downy Woodpeckers at this feeder type in The Bird Feeder Area; and although I did see a lone male house finch in the vicinity, he was not at their "Monopoly House," rather he watched the goldfinches from the vantage point of a branch on a tree; as evidenced below. 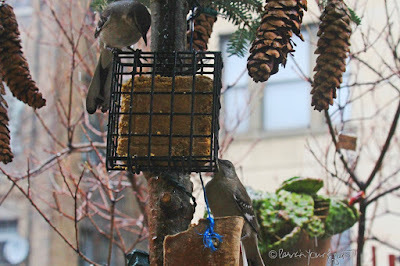 And there you have it, dear reader, a bit of info re The Bird Feeding Area in Central Park and in my rooftop garden. 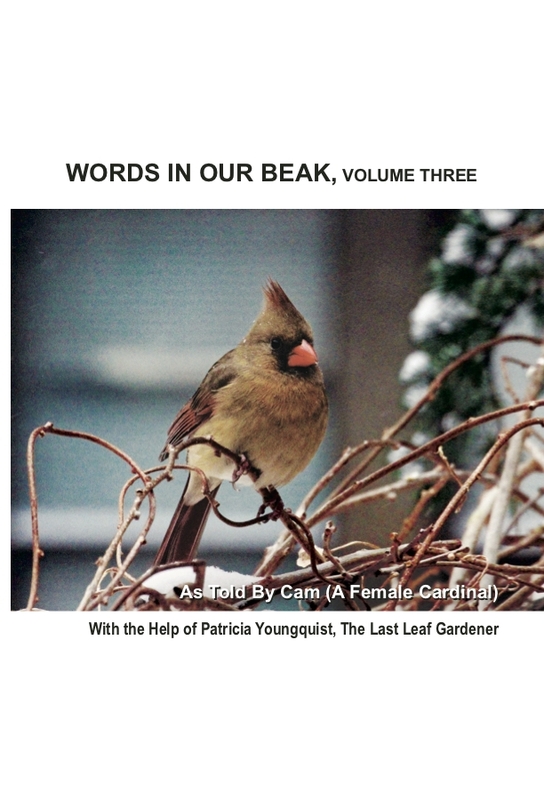 Btw, all of the birds seen within this posting are featured in my three volume book series, Words In Our Beak. 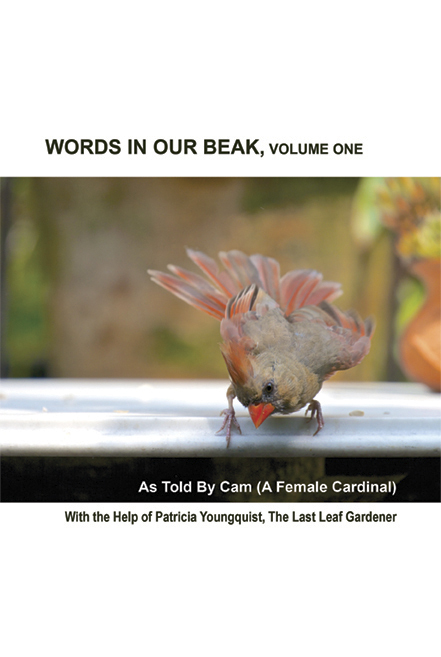 EACH OF THESE BOOKS CAN BE ORDERED FROM ANY PLACE SELLING BOOKS BY GIVING THEM THE TITLE, OR ISBN, OR MY NAME, PATRICIA YOUNGQUIST. 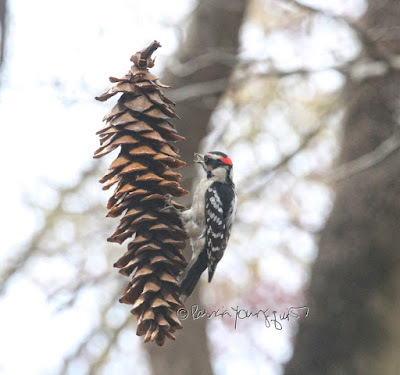 It's Look Up In The Sky Day! 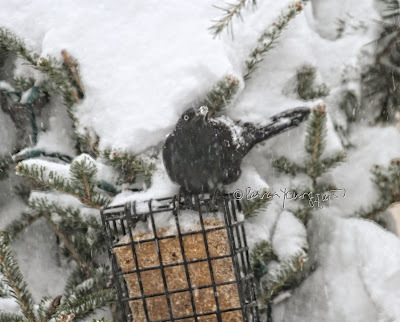 "Splish Splash:" A Grackle Takes a Bath! Saturday night's alright for posting? 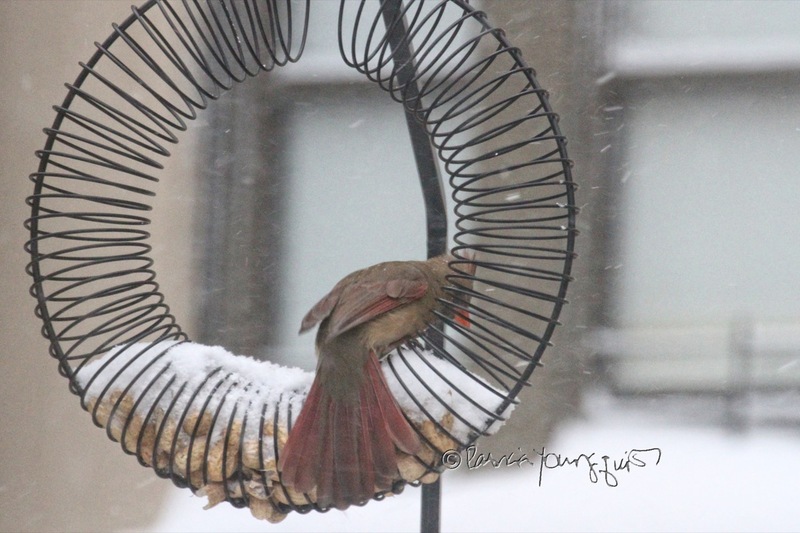 Yesterday wasn't a good one for a fish in CP!